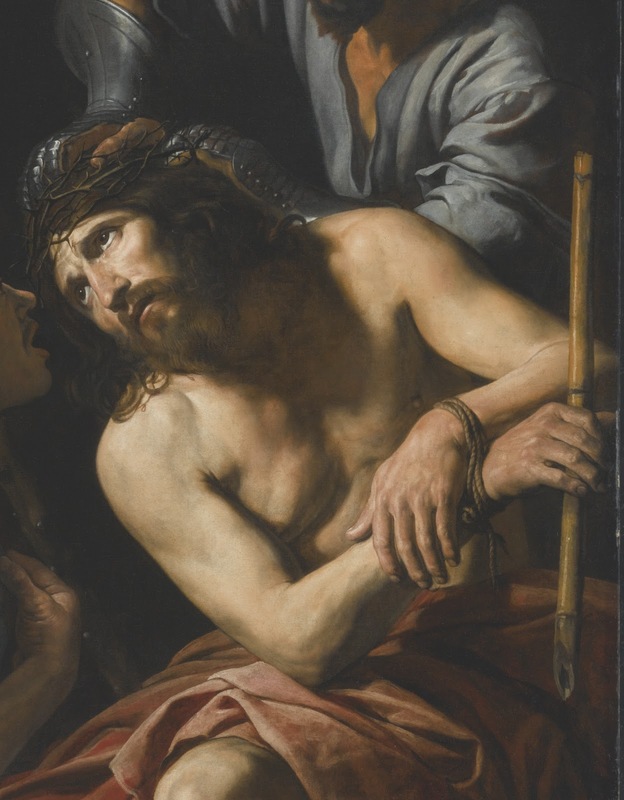 This masterpiece of Baroque naturalism is among the first known works painted by Valentin de Boulogne, Caravaggio’s most accomplished French follower and arguably his greatest acolyte. Painted in Rome in 1615 or shortly thereafter, it shows to what extent and how quickly the Frenchman had absorbed Caravaggio’s radical innovations. Caravaggio's redefining style had immediately drawn artists from all over Europe to the febrile artistic milieu of the Eternal City. Few, if any, however, were able to match Valentin’s bravura in mastering the realism and economy of design which were to dominate Baroque art throughout Europe for the first stage of the 17th century. It is not entirely clear when Valentin arrived in Rome, but it may have been as early as 1611, when a 'Valentino francese' is mentioned as living in the parish of San Nicola ai Prefetti. The first confirmed mention of him is in 1620, when a 'Valentino Bologni, francese' is included in the parish listing of Santa Maria del Popolo. Unlike Caravaggio, who was known as an abrasive and often solitary character, Valentin was comfortable mixing with artists both local and foreign. In 1626, for example, he took charge of the celebrations of the Accademia di San Luca, Rome's artists' guild, to mark the feast of Saint Luke. His companion in this endeavor was none other than Nicolas Poussin, a fellow Frenchman and an artist who represented the other main strand of Baroque art in Rome at the time. The Taubman Crowning with Thorns captures perfectly the artistic currents prevalent in Rome during the second decade of the century. Valentin’s interpretation of the tenebrist idiom, possibly learnt through Bartolomeo Manfredi, is not used as a generic commonplace, frequent in second- and third-generation followers of Caravaggio, but as an instrument to render more acute the intensity and drama of the scene. 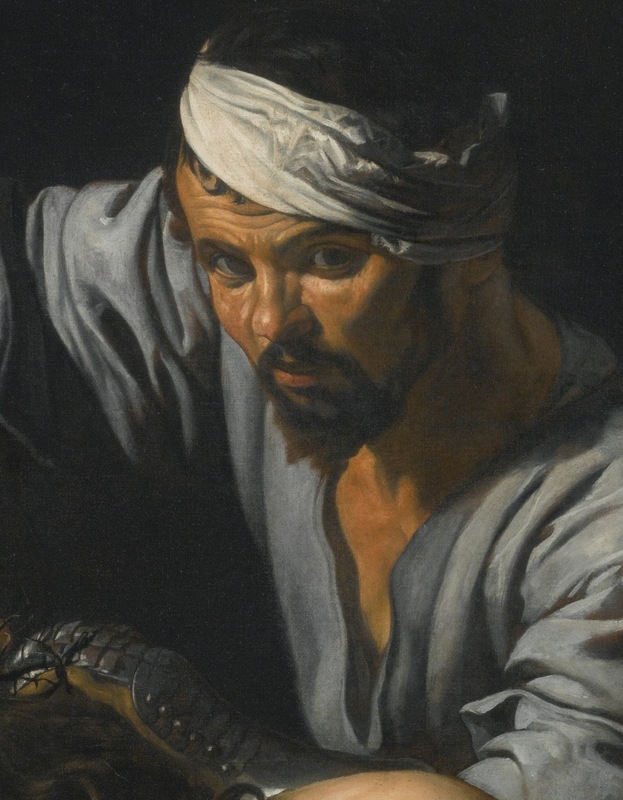 The cinematographic effect of the spotlit figures is faithful to the last to the ethos of Caravaggio, whose use of light often turned it into one of the protagonists of the action, and not a mere formal device. Moreover, the pathos of the subject matter, taken from the twenty-seventh book of Matthew’s Gospel, is the perfect vehicle to transmit the directness of the early Counter-Reformation aesthetic. The torturer who looks out at us in challenge and engages our attention draws us into the scene, making us both witness to and participant in the cruelty of the drama. The figure lower left, meanwhile, mocks and jeers at Christ, whose head, appropriately, is at the very center of the compressed and compact composition. The source of the design possibly derives from Caravaggio’s Crowning with Thorns in Prato. The subject was popular with many Caravaggesque artists and is one which Valentin returned to repeatedly. Another treatment of the subject, horizontal and with five figures, is in the Louvre, Paris (Mojana, op. cit., no. 13, pp. 78-79, illustrated). Two further treatments of the subject by Valentin from a few years later in his career are both in the Alte Pinakothek in Munich (ibid. no. 6, pp. 64-65, and no. 18, pp. 88-89, respectively, both illustrated in color). One of these is of the same format as the present work and is of similar dimensions but is far less compact in its design. While the quality and refinement of the Munich work are by no means lesser than the Taubman picture, the scene is arguably less intense and lacks the immediacy and directness of the present work. Nor can the Munich picture boast the rich red folds of Christ's robe, which add depth to an otherwise reduced palette. The obvious success and popularity of the composition is attested to by the fact that two copies are known: one was formerly with Edward Speelman, as by Terbrugghen, though this attribution can no longer be upheld; another was sold in Venice, at Semenzato, December 15, 1985, lot 115. La incoronazione di spine è un episodio della vita di Gesù narrato nei Vangeli di Matteo (27:29), Marco (15:17) e Giovanni (19:2) e citato già da commentatori antichi e padri della Chiesa come Clemente Alessandrino, Origene e altri. Raffigurazione dell’episodio della Passione in cui due soldati romani spogliano Gesù e lo rivestono per scherno da “Re dei Giudei”, con un mantello rosso, una corona di spine intrecciate sul capo e una canna come scettro nella mano destra. 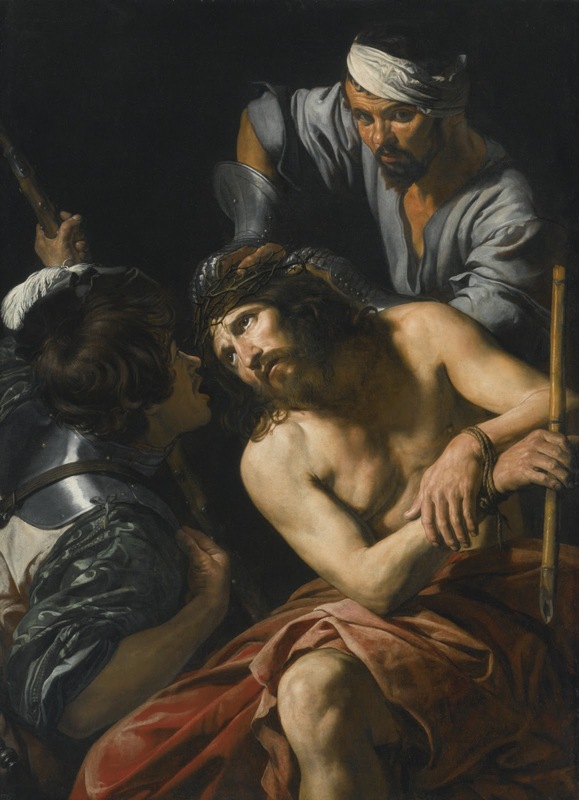 Valentin De Boulogne, giunto a Roma negli anni Dieci del Seicento, è stato uno dei più autentici eredi di Caravaggio, che, pur non lasciando una sua bottega, ebbe tantissimi seguaci. L’artista ottenne la protezione di illustri committenti quali i Barberini e grazie all'appoggio del cardinal nepote Francesco -nipote di Urbano VIII - egli ricevette l’incarico di lavorare accanto a nomi prestigiosi come Simon Vouet (1590-1649) suo presunto maestro e Nicolas Poussin (1594-1665).